Our reassuring belief in a unified reality betrays a rather more fragmented truth, in which what appears to be constituted by its own essence is in fact rendered by the cuts, breaks and interruptions between discrete parts, each one too small to fully grasp. Swapping skills and materials, the artists behind Stage Fright have, over the past few months, formed a web of exchange and quotation, with each artist applying his or her preferred techniques and methodologies to the products of the others. 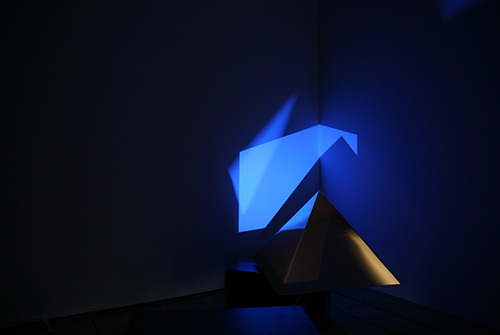 In the first stage of the process, videos shot by Laura Buckley were selected and cut by Haroon Mirza according to their visual and audio shapes. The resulting samples were then given to Dave MacLean, who juxtaposed them based on their sound values alone, composing four audio tracks whose corresponding visual sequences were ther esult of chance, albeit within carefully set-out parameters. Temporarily segregating the sensory registers of audiovisual material — i.e. image and sound, this process allowed each, in turn, a guiding role before they were joined together again in the finished videos. The resulting montages consist of extremely brief clips that operate independently of their original sources and are infused with the preferences, styles and speeds of the three collaborators. The web of exchange then developed a feedback loop, in which the new video mixes were returned to Buckley to be staged in an installation that is typical of her aesthetic of geometric constructions and plain industrial materials. The recording, editing and sequencing technologies used in the making of Stage Fright have produced richly patterned films that rely on the rapid sequencing and repetition of very short clips — too short, in fact, to be clearly or distinctly comprehended. Their rapid-fire pace compels the viewer to keep up, charmed and baffled by the intensity of the rhythm. Such a feat seems almost within reach, until the spell is broken by the comedy of a sample taken so entirely out of context as to be ridiculous, its outlandishness snapping one’s attention back to the physical surroundings and prosaic edges of the here and now. While it is methodologically driven by an ethos of collaboration and synthesis, Stage Fright, with its staccato videos and exact sculptural lines, enjoys an aesthetic of striking fragmentation. This paradox of togetherness and separation — flow and interruption — is emblematic of the conflicted nature of consciousness, whose sense of a integrated temporality, impressions of smoothness and illusions of identity mask an altogether different reality in which multiplicity and fragmentation rule, and meaning is generated by endings; by the little deaths of image, sound and text. The apparent seamlessness of individual consciousness and the seeming unity of a work of art betray the shattered reality of their constitutive processes and components. In the case of Stage Fright, this reality is mirrored in the work’s aesthetic. There is a fundamentally unresolved identity at play in the making of Stage Fright, with Mirza extracting fragments of Buckley’s artistic voice, offering them to MacLean to integrate the two blind, before handing them back to Buckley for a final synthetic chorus. Such behind-the-scenes exchanges and shared authorship, while revealing a strong sense of trust, also hint at the fundamental — or rather, metaphysical — disconnections implicit in any group, process or product.